Subject matter: This is a simple still life inspired by the beauty of this red pear. I really don't care to eat pears much but I love painting them, especially the red ones. 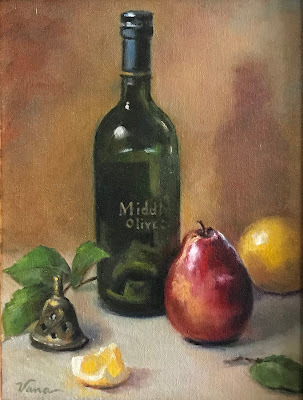 And, of course, I never get tired of painting lemons. I could paint lemons daily and never get tired of doing so. We should not call bad products "lemons" because this is disparaging to the beauty of lemons. The bottle is an olive oil bottle that grabbed my attention because of the product name, Middle Earth Olive Oil. Technique: Lettering is extremely difficult for me but I may be making a bit of progress. Tips on this, anyone? Has anyone else found a technique for lettering that works? Feel free to comment on this.